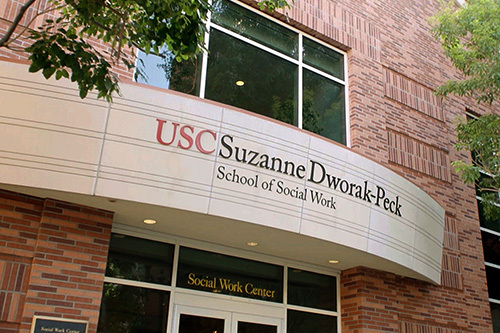 The USC Suzanne Dworak-Peck School of Social Work offers six degree programs in social work and nursing. Our Master of Social Work (MSW) program is considered one of the best for preparing clinical social workers, with alumni equally successful in policy practice, advocacy and program administration. The highly regarded program is also offered online through our MSW@USC program, which offers web-based learning and traditional field internships in local communities. We also offer several dual degree programs to go with our MSW in the fields of law, business, gerontology, planning, Jewish nonprofit management, public health, public administration, and PhD in Social Work. We also offer a wide range of educational options in our Global Programs that include international, national and community initiatives. The school's online Doctor of Social work (DSW) program prepares experienced professionals who are looking for leadership or management positions to develop solutions to large-scale social problems. Our PhD program is a leader in its field, helping students develop a portfolio of research and teaching that will prepare them for the challenges they face as the next generation of academics and researchers. We also offer a Master of Science in Nursing (MSN) for those who want to become family nurse practitioners (FNP). The online program prepares FNPs to address the physical, social and environmental factors that affect patient well-being.